Can you see the double rainbow? p.s. It was pouring when this picture was taken! Sharing a little something different on TBP today. Last month, I submitted this piece to The Irish Times' travel writing competition. Although not the winner, I wanted to post the story here. Getting a bit more personal, if you haven't read our Welcome Post, my husband and I moved from San Francisco, California to Dublin, Ireland in March. Looking back on it so far, the experience has truly allowed me to open myself to new opportunities. Let's just say that my type-A, overachieving, "East Coast" personality used to inhibit interactions with new people. I've learned to let go and now seek those chances to immerse myself in new cultures. I actually now meet perfect strangers that I've found through social media (hello We Are Travel Girls) and gladly engage in conversation with locals. In fact, sometimes listening to other people's stories is the best part of traveling, not to mention they always have the best recommendations. 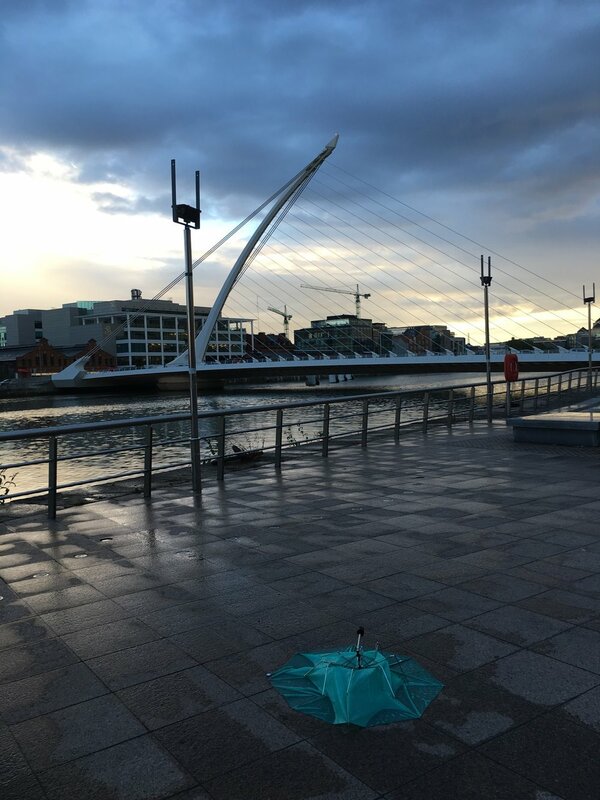 I hope you enjoy as I take you through my first day in Dublin when my attitude was a bit different. The story shares my initial impression as well as nods to typical Irishisms. As always, would love to hear your thoughts, so please leave a comment below! After landing bleary eyed off the ten-hour flight, we made our way through immigration and collected our luggage, containing belongings for a year abroad. In the terminal, we tasted our first sweet flapjack while wondering why everyone around us was drinking so early in the morning. I wasn’t fully awake, but moved through the motions as we wheeled our absurd amount of luggage, which garnered many watchful eyes, towards the elevator. Inside, a man asked if we needed a ride. I avoided conversation, but my husband, Dan, engaged. The man assured us that he was a taxi driver and his van could haul our 12 bags. I couldn’t really understand him through his thick accent and was skeptical. Isn’t it a rule to never accept rides from strangers? Against my better judgement, we followed him out to the parking lot. Everything turned out just fine. As we drove through the city, the driver shared dark-humored stories while we sat in the back giggling about his overly-sociable demeanor. Upon arrival, he wished us well and told us to enjoy the grand weather. Once settled, we pledged not to nap to beat the jet lag…we woke up six hours later to complete darkness. We put on our raingear and ventured outside. It was cold and windy and I was cranky. I wasn’t allowed to carry an umbrella because we were told that locals find them useless. We were drenched, and walked forever before finding a restaurant. Why was everything in the city center closed at 9pm? After dinner, the city was eerily quiet as we looked for a place for Dan’s first black stuff. We found a low-lit pub on a corner. An older gentleman was sitting alone at the bar and a few groups sat talking in hushed voices around wooden tables with long candlesticks laden with dripping red wax. I asked the barman for a warm drink. Shane introduced himself and said he knew just the thing while the lone man attempted to strike a conversation. Once again, I didn’t engage. Shane concocted a complex cocktail that concluded with lighting something on fire. He asked us where we were from. He couldn’t believe we’d arrived just hours before and were staying for the year. “Why would you do that?” he asked half-jokingly. At our table by the window, Dan asked why I’d given the cold shoulder to the gentleman. I didn’t have a good response, only that at home people don’t make friendly conversation. He said to get used to it because this is Ireland and things are different here. As I took my first sip, I smiled. The whiskey went down smoothly and warmed my whole body from the inside out. I turned my head to the man at the bar and nodded. He smiled back and in that moment, I knew I was going to like it here. I didn’t know the word to describe it yet, but the craic was and continues to be ninety in Dublin.